Paving patterns can add a lot of texture and interest to the surface of any scale model scene. Fans are the most difficult pattern to layout, but there is an easy way to make this old world surface quickly. If you prefer the same method can be used to make all kinds of cobble patterns. Cobblestone fans add an old world look to the surface which aligns with the shop style. To make this type of paving, the fastest method is to use your favorite brand of air dry clay and a custom made 'cutter' in the appropriate size. If you wish you can color your clay with acrylic paint to the shade you want for the filler beneath the pavers, or you can paint the pavers and the spaces between them with a faux finish once the air dry clay is dry. 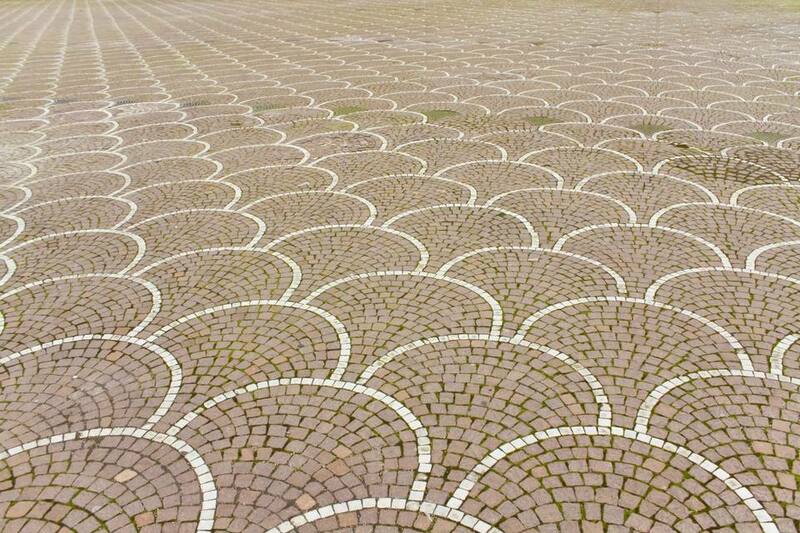 The fan paving pattern is fairly easy to draw out to fit the area you want to pave. We set our fans up for 1:12 dollhouse scale, using 1/4 inch/6millimeter pavers (sized to represent 3-inch/7.5 centimeters squares in full size) You will need a drawing compass or one basic circle drawn to the right size that you can use as a template for the other circles. To draw the fan pattern start with a circle whose radius equals the depth you want for your fan. (I used a circle 5 inches/12.5 centimeters) in diameter. Divide the length of the radius in half, and mark that line between the center of your circle and the outside rim of your circle as shown. The half radius mark is the line on which you will place the center of your next two circles (the two green circles in the photo), drawn so that they meet at their edge, along the vertical line through the center of the first circle (dark blue). The next line of circles is drawn with their centers running along a horizontal line that touches the outer edge of the first (dark blue) circle so that their edges meet the first circle center line. The first of this line of circles is directly under the first circle. The fan pattern is made up of the lines where the circles intersect (see photo). Once you get the basic fan pattern established in the size you want, you can easily use it as a template to enlarge the pattern for your paved area. Once you have your fan pattern worked out to take a piece of paper and make an accurate template of the area you want to pave with cobblestones or 'setts'. Set your fan template beneath it or on top, and transfer the fan outlines onto the template, setting the fans so that they are centered on any major features (this pattern centers on the door of a shop). Now practice setting the cobble shapes using a simple stamp made from a scrap of an eraser, cut to the size you want your cobbles. We used a roughly 1/4 inch square/6-millimeter square paver shape cut from an eraser to test out our pattern. The stamps should go across the top of the fan, then up each side, then in ranked rows across the fan from the top down in order to make the best fan shapes. Turn the stamp to keep one edge along the curved line to make the most well-balanced fan. Don't skip this practice! It will make it much easier to get finished fans when you are working with your air dry clay. Once you know how to fill the fan with cobbles, you will have an idea of whether you need a larger or smaller cobble shape to correctly line up in your fans. You should have space at the base of each fan outline to put two cobbles roughly side by side. If your stamp is too big for your pattern, reduce it in size using a craft knife or polymer clay blade. When you have worked out a good size for your cobble shape proceed to make a custom cutter for your final cobbles. You only need one, roughly square cobble shape, unless you want North American "Modern" Fan patterns which also use rounded triangles. Use the instructions for making custom cutters from scraps of aluminum pie plate foil and waste polymer clay to make a roughly square cutter. Bend the doubled strip of foil at right angles using a straight edge, needle nose pliers, or the ends of a pair of bent nose tweezers to get a tight square shape. Open one folded end and insert the other end of the foil to finish the shape. Once you have the cutter shape made, carefully insert it into a small ball of waste polymer clay so that at least 1/4 inch/6 millimeters sticks out of the clay, and bake the clay handle onto the cutter at the oven temperature suggested for your clay. Now you are ready to proceed with preparing the air dry clay paver layer! To set a uniform layer of paving on a base it is important to have a clay sheet which has a uniform thickness. For the store frontage we have, the paving layer needs to be level with the bottom door sill. To make our air dry clay sheet roughly that thickness, (it will shrink slightly as it dries) we used two strips of craft wood the same thickness as the door sill as spacers for rolling the clay. To keep them from becoming coated with the clay, wrap them in scraps of plastic wrap before you began. You will need lengths of material the same length as the strip of paving you require. With the strips wrapped in plastic, set a piece of waxed paper/freezer paper or plastic bag under the wood strips. Use your template to set the strips apart the width you need for your paving. Tape or clamp the guide strips in place on your work surface. Masking tape/painters tape usually works fine for this. Now that you have your spacers set up, remove your paper template and press some of your air dry clay between the spacers. Use your hands to roughly set it flat. Take a glass bottle or polymer clay roller and run it along the spacers to hold the roller above the polymer clay at the correct height. Roll your clay flat between the spacers, removing and adding clay as needed until you have rolled a sheet of clay the right size for your cobblestone paving template. To trim your pavement layer to the shape of your template, set your template upside down over the layer of clay and trim around it with a craft knife or clay blade. The template needs to be upside down on the top of your clay as you will be picking up the clay on the plastic or paper you rolled it out on, then flipping it upside down so the paper/plastic is on top of the clay and peeling the paper/plastic away. This is the same way many people flip pie crust from rolling clothes into a pie plate. Try to avoid pressing down on the even surface of the clay while you are cutting around the template. When you have finished trimming your air dry clay it should be fairly uniform with neat edges, especially on the sides where it will meet up with structures. Don't worry if the surface isn't perfectly flat. The top surface as it sits on your worktable is the surface which will be glued down to your pavement base. To prepare your base to hold the air dry clay layer that will form your cobblestone pavement, start by marking the template edges on the base. To make firm pavement layers the base of your model should be made of wood (preferably plywood or MDF), high-density insulation board or gatorboard/gator foam. When you have finished tracing the template edges, check the face any structures that meet against the pavement to make sure your template is correct. In the case of the miniature storefront the front is attached to the back of the box with magnets, so the fit of this against the pavement template was checked before proceeding to the next step. 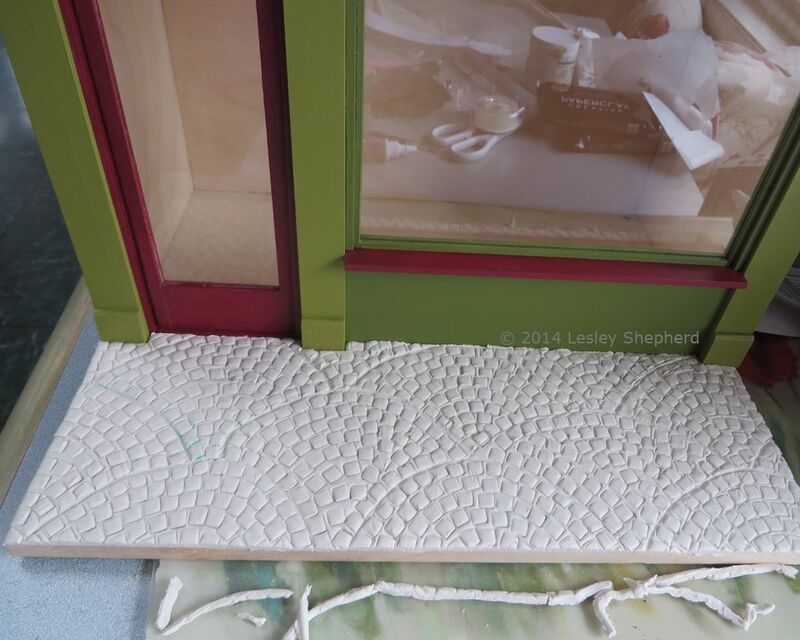 To hold air dry clay pavements securely to the structure of your model base you need to spread a thin layer of carpenters glue or PVA glue (white glue) to the base. Use your glue applicator/bottle to make a snaking line of glue across the area which will have cobblestone pavers, and then spread the glue to the edges of your template markings using a glue spreader or a scrap of plastic. You will need to work fairly quickly in order to get to the step of applying the air dry clay to the base before the glue sets. Once your base has glue applied to match your template, pick up your air dry clay on its paper or plastic and carefully flip it over onto the glued area, lining up the edges of the clay piece with the template markings. The clay will cling to the base plastic or paper while it is wet helping to give you some control while you place it beginning at the edge which will be up against a building wall, then gently rolling it off onto the glued area of your model base. When you have the clay in place, press it down gently into the glue using your roller to brayer the clay onto the glue. Try not to thin out your clay layer as you roll it. Don't worry if your clay layer overlaps your edges slightly they will be trimmed off later. Test any edges that fit against moveable walls by inserting the wall, trimming the clay layer if necessary. Make sure that doors will open against the thickness of the clay layer. It will shrink slightly as it dries and can be sanded if necessary, but large errors in thickness are easier to repair while the clay is damp and pliable. If you must leave your work at this stage don't despair. You can place a layer of damp paper towel or a wet rag over your air dry clay and cover it with a layer of plastic or cling film to prevent the clay from drying out until you can shape it. Air dry clay will stay damp for several days if you check on the dampness of your paper towels occasionally. Avoid this as possible as you may also inadvertently dampen your support layer which can cause problems if it is unsealed MDF. Set your pavement template showing the paver layout on top of the air dry clay layer you have gently glued down. While the air dry clay is still pliable, use an embossing tool or ballpoint pen/rounded toothpick or skewer stick to trace over the outlines of your main pavement pattern, in this case, the fan lines on the template. Make sure you trace every main pattern outline for your layout without pressing too hard on the clay. Remove your paper template from the clay and use your embossing tool to gently remark the lines so they are clear. Do not press the lines down as far as the base layer. Only make the marks deep enough to see clearly. To start stamping the cobblestone pattern into your air dry clay layer begin with the fan edge which will be against a building and work back. Each fan should be stamped across the top first, rolling the stamp slightly between markings to angle the blocks evenly across the top of the fan as shown. Don't panic if your spacing is off. Use your roller or fingers to brush out the cobble marks and start again, adjusting your spacing closer or further apart if necessary. As all your fans should be the same size (this is what the practice earlier was for) you should easily get the spacing down pat. Once you have the top line of cobbles set, do the sides of each fan, then work lines across the fan from side to side matching the side cobble lines to the line across the fan. Don't worry if there is an odd gap. Real pavements are not perfectly regular. Once you have all your fan patterns stamped into your clay you may want to re-outline the outer edges of the fans with an embossing tool to accent the shape. Check that the clay still meets the established edges of the template, especially against any building walls. Use a polymer clay blade or craft knife to trim the clay layer along the outside edges of the base. Check the door swings and the fit of the clay against any walls pressing it gently if necessary to make a tight fit. Set the pavement aside to dry. When the pavement is thoroughly dry, fill any cracks which occurred, or fill any areas where the air dry clay layer has shrunk away from the edges of your base. Sand the edges of the dry pavement layer if necessary in preparation for any finished wood edges or trim you may wish to use to finish the model. Finish your dried air dry clay with fine sandpaper or by 'burnishing' the clay with a damp sponge or cloth. Allow it to dry completely. If you did not add color to your air dry clay to make the 'grout' color, apply a wash of the color of your choosing to have between your pavers. Take care to work the color down to the base of all the lines between the pavers. Allow to dry. Traditional cobblestone pavers can have light or dark sand between them so choose the color that works best with your display. Apply washes of your chosen paving stone color to the entire pavement using a dry brush technique to avoid adding color into the "grout" lines between pavers. Pavers come in a wide range of colors so work out a scheme that will suit your model. Finally, run a light wash of your "grout" color over the area between your pavers to define the spaces. Leave to dry. The acrylic paint covering is usually enough to seal the air dry clay against moisture, but if you wish, use a clear acrylic spray or brush on matte varnish to seal the cobbled pavement against moisture.